After the initial euphoria of the Nikon 1 V1 it’s probably true to say subsequent models failed to capture the imagination in quite the same way. Now with the introduction of the waterproof AW1 Nikon has cleverly won back interest in the system. Read on to find out how this super-compact and submersible model performs. When launched, the EOS-M complete with the EF-M 18-55mm f3.5-5.6 IS STM zoom was $899, but the kit can now be had for as little as $345. With lens available separately for $269 that sounds too good to be true. Read on to see how well the combination performs. Launched in September 2011, the Samsung NX200 marks a significant point in the NX line because it features an all-new APS-C CMOS sensor with 20.3megapixels. Among the hybrid cameras, this is about as big as sensors currently get, so Samsung are aiming at the high ground, a fact confirmed by the premium feel all-metal body – a first in the NX-series. In the Nikon 1 line of digital compacts with interchangeable lenses, the V2 brings some nice new features: shooting at 60 i/s, Full HD video recording in 60p, different modes for slow motion, and … a new 1-inch, 14.2-megapixel, 6400 ISO CMOS sensor that we can hardly wait to test! 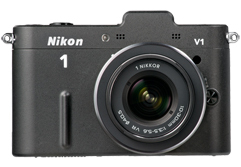 But while we wait for its appearance on the market, here’s all the skinny on the Nikon 1 V2.